MOUSETRACES – 2002 | JONAH BRUCKER-COHEN, PH.D. MOUSETRACES – 2002 – JONAH BRUCKER-COHEN, PH.D.
Share your mouse movements across distance. 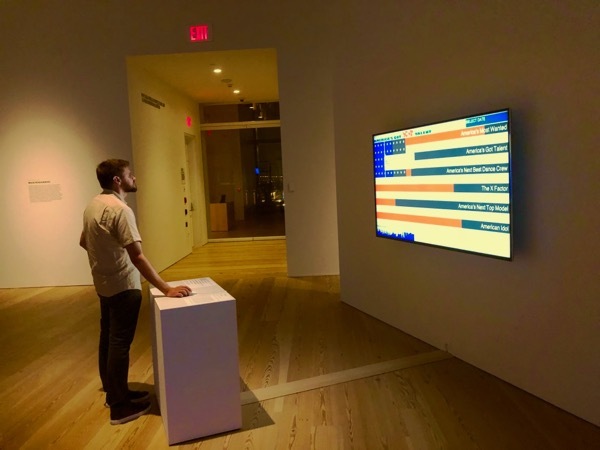 MouseTraces is an application that focuses on background connectedness and awareness between two people across distance. Looking at the specific relationship of networked computer usage, the project captures mouse movements on the desktop and transmits a graphical representation of this movement across the network to the other person. Note: This project may be available for download again soon, (Temporarily Offline). Current connections between people separated by distance take place during time specific intervals – i.e. when you have time to write that email, call the other person, send them a letter in the mail, or send them an Instant Message. Instant Messengers (ICQ, AIM, MSN Messenger) are perhaps the closest thing we have to a constant connection since when both people are logged in each is instantly aware of the other person’s presence, activity (away, busy, available), and personal information. Still, the method of communication between people connected to IMs requires foreground activity such as opening a window, typing a message, and clicking the send or return buttons. Instead of relying on this type of foreground connection, MouseTraces keeps track of each person’s desktop activity in an ambient, non-intrusive way. 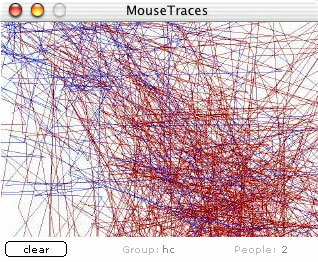 MouseTraces was a desktop application for Mac or PC that opened a 320 x 240 window on the desktop of each machine. It was a networked application meant for interaction between two or more people, therefore when it was opened users were prompted to enter a group name. Users then connected to the group along with one or more people who knew the group name. Once opened, the MouseTraces client grabbed the appropriate conduit to send information. The application was meant to stay open the duration of the day, month, year that the two or more people were apart. If closed, v.1.0 erased all of the movement and patterns that occurred in the past. Future versions will allow for histories of movement to be collected and tracked when the application is closed. Each user was represented as a different colored line (red or blue) drawn between the current and last points the cursor occupied. This mapping gave a direct relationship to the way the other connected person was using their computer. It also showed the path of their mouse over time and created a time-based system showing “traces” of all the activity that that user generated over a period of time. There was also a “clear” button that allowed each user to refresh the trails if they wanted to measure specific patterns for specific durations.